So, you are suffering from terrible bloating during pregnancy? You’re not alone. Almost all pregnant women suffer from this during sometime during pregnancy. Like other problems associated with pregnancy like leg cramps, insomnia during pregnancy, thyroid, and gestational diabetes, bloating has troubled many women. Let’s dive into the problem head-on and learn how to solve this nuisance through home remedies. What is bloating during pregnancy? When does bloating during pregnancy need medical attention? What are the causes of bloating during pregnancy? 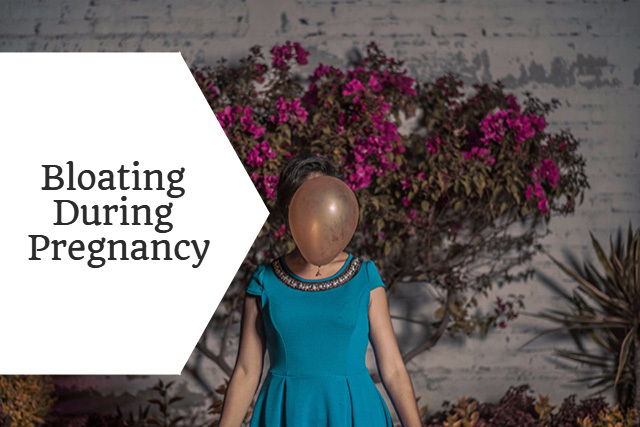 What are the consequences of bloating during pregnancy? Bloating during pregnancy is the swelling in the abdominal region due to flatulence and fluid synthesis. Higher progesterone levels: Higher progesterone levels during pregnancy are essential for maintaining the pregnancy. The progesterone, however, relaxes the smooth muscle tissue of the gastrointestinal tract. This inhibits the digestion causing associated problems such as water retention, bloating, constipation and flatulence. Constipation during pregnancy: Bloating is caused by constipation. As your gut is not clean the waste matter generates a lot of flatulence and borborygmus resulting in bloating. Dehydration: A woman who doesn’t drink enough water during pregnancy might have dehydration. Lack of water results in inefficient digestion leading to bloating. Increase in size of uterus compresses the stomach: Increased size of uterus leaves very less space for the stomach, and that causes abdominal discomfort and bloating. Flatulence: The most common cause of bloating is flatulence and pregnancy have this cause even more aggravated. Drink a lot of water: Water is essential for the movement of food and a maintaining a healthy circulation in the body. Drinking water will help prevent bloating targeting all causes of bloating. One should drink at least one full glass of water every hour when she is expecting. Avoid oily foods and junk food: Oily foods obstruct proper digestion, and aerated drinks themselves induce flatulence and bloating. During pregnancy, you deal with constipation due to increased uterine size. Bowel movements do not occur efficiently. Hence it is advisable that you stop eating any junk and fried food. Eat foods loaded with fiber: Bloating during pregnancy is even more painful due to doubling of pressure in the abdominal cavity. Eating fibrous foods help make the food move through the gut faster and easily. Also, fibers will make you feel fuller for a long time preventing you from snacking. Stop smoking and minimize the intake of caffeine: Smoking and caffeine are dangerous for a pregnant woman and her baby. of them is bloating due to the toxins that need more fluids to break down. All this gets accumulated in the abdominal cavity and hence causes bloating during pregnancy. One must stop smoking as soon as she decides to become a mother. Caffeine is also addictive and diuretic. A pregnant woman needs to minimize caffeine intake. Eat natural laxatives to treat pregnancy bloating: Natural laxatives are better than suppositories or medicines for treating constipation. They won’t ever lead to an allergic response. They are safe even in large quantities. That is why it is best to have natural laxatives like mint leaves or sugarcane syrup during pregnancy to cure pregnancy bloating. Use a pillow while sleeping to prop up your baby bump: When we sleep, we cannot control sleeping posture. It might cause one to sleep over her baby bump, and that will undoubtedly lead to swelling and bloating during pregnancy. Also sleeping with baby bump sagging down will cause the fluids to move aggravating the pre-existing pregnancy bloating. Eat at regular intervals: We tend to get these phases of extreme hunger outbreak and hunger strike during pregnancy. However, it is ideal to control a bit and force feed a bit in respective cases. Eating at regular intervals helps to avoid stuffing up and hence allows gradual digestion. It prevents bloating during pregnancy. Don’t let stress or anxiety take over you: Stress and anxiety are natural during pregnancy. But the level of stress is controllable. Women tend to over think about things during pregnancy. All this disturbs the homeostasis of the body and causes several other problems such as bloating during pregnancy. Massage your baby bump to heal bloating during pregnancy: Massaging is more than welcomed during pregnancy. A gentle oil massage on your baby bump can help to alleviate bloating and even will reduce stretch marks after pregnancy. Wear loose clothes to prevent bloating during pregnancy: Wearing loose clothes prevents any compression of the baby bump. Thus it ensures a well-regulated blood circulation. Body fit tight clothing can have unfavorable effects. One shouldn’t wear them even during the early stages of pregnancy. Eat foods that taste bitter as a home remedy for bloating during pregnancy: Eating foods like bitter gourd or kale which are rich in antioxidants is very beneficial for bloating during pregnancy. They degrade the harmful toxins forming in your body or as wastes from your baby. Always support your baby bump with your hands in later stages of pregnancy: Women might like to keep a hand on their baby bump, but it even serves a purpose. When you support your baby bump while sitting and getting up, it prevents the chaotic movement of fluids in the womb. When one maintains a stable posture, there is no need for reversal of the changes whenever you move. Eat food that treats bloating during pregnancy: Fenugreek, Sugarcane, Peppermint, Coriander, and Basil treat bloating. These foods are home remedies for bloating during pregnancy. They enhance digestion and even cure bloating due to other causes. The natural compounds present in these foods prevent flatulence and relieve bloating cramps. Avoid foods that cause bloating during pregnancy: These bloating inducing foods have a lot of bicarbonate and other such chemicals that aggravate bloating. It is best to avoid these foods. Cook them at a high temperature if consumption is inevitable. Exercise and go for walks to prevent causes of bloating during pregnancy: Women restrict exercise and movement during pregnancy. Nonetheless, they are essential for your baby’s health and for you too. Exercise and stretching keep the muscles agile and thus helps to heal and prevent bloating during pregnancy.